In Hannah and the Pirate Caves, you play as Hannah, a daring little Usul that is always looking for adventure. One day, Hannah was reading a book that spoke of pirates caves built by ancient pirates. Hannah stumbled across the caves "neomagically" (Neopets does not give an explanation of how she stumbled upon the caves)! 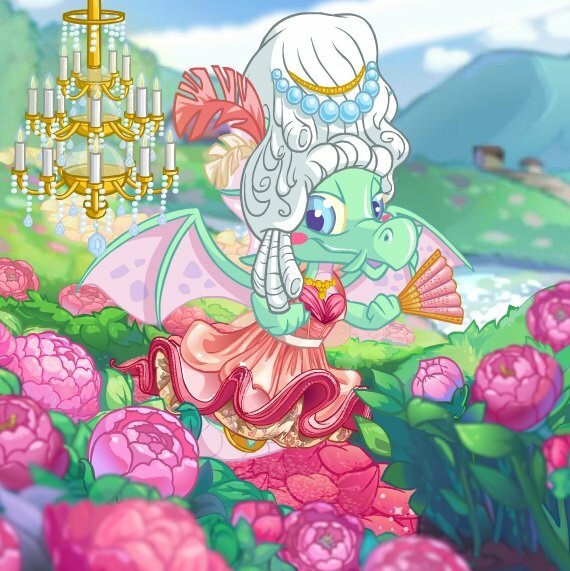 Hannah's adventure on Krawk Island begins! Let's make this short and sweet. 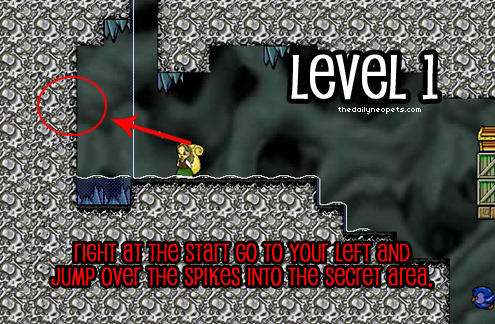 Similar to any other game, you use the left and right arrow keys to control Hannah. One of the first questions asked is "how do I jump?" Although this may seem a bit weird, you use the space bar to jump. To look up, you can use the up arrow key. Occasionally, you will encounter a space that is too small to walk through, so you can crouch down by pressing your down key. Just remember: space bar, left, right, down, up. That's how you maneuver around. Let's go over some of the basics. One of the most common things you will encounter is wooden crates. 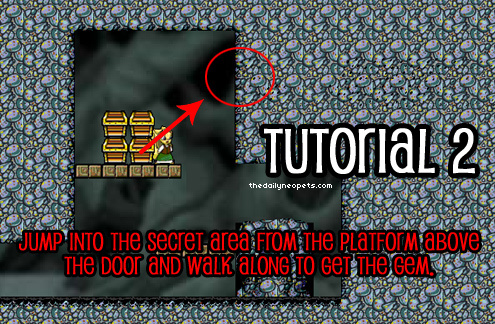 You can bash through wooden creates easily by walking or jumping on them. You cannot bash metal crates. 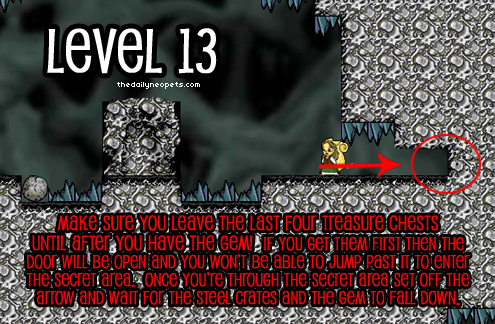 In every level, there are treasure chests in which you must collect. 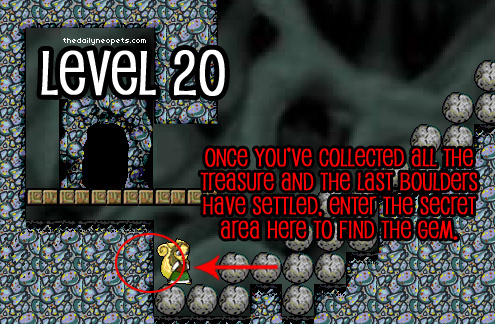 You cannot pass on to the next level until you get collect all of the treasure chests throughout the level. 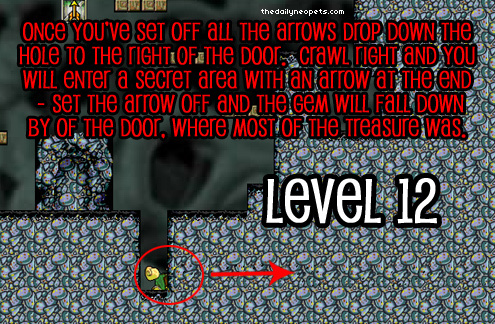 Occasionally you will find a passage that is too narrow to walk through (that's when you use the down key). Every once in a while you will encounter a wooden platform as well. You can jump up through these. The game sounds pretty safe so far, huh? Well you're wrong! 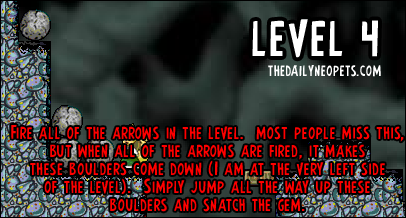 In every level, there are dangerous arrows! Some crates are loaded with an arrow. When broken open, the box with an arrow in it will fire out an arrow. 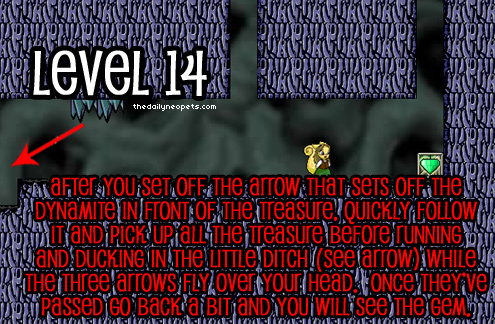 In some of the harder levels, arrows will be shot at you (which is bad, becuase arrows can kill you). Arrows can break open or destroy metal crates, so that's one good use for arrows. 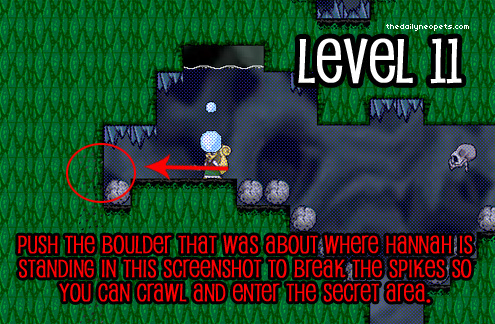 Another thing that is found in levels are boulders. They may block your way, but if there is room, you can push a boulder along. When boulders are together (two in a row/column) they cannot be pushed. If a boulder falls on a wooden platform, the boulder will smash it (good use). 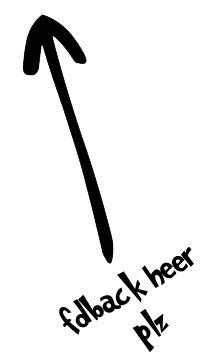 If you push a boulder onto a spike, it will smash the spike. 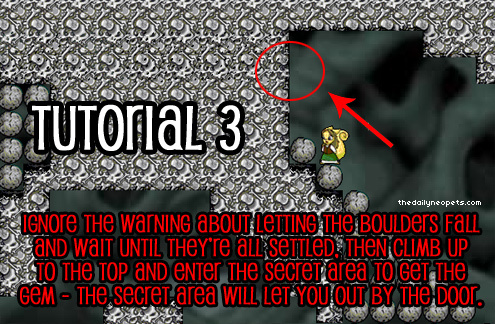 Falling boulders can and will kill you, so be sure to watch out for that as well. 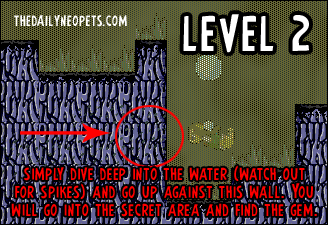 Keep in mind that Hannah and the Pirate Caves is a kind of puzzle, so boulders, arrows, and other things can set off traps! Some crates are loaded with dynamite. Dynamite (if fired at you) can kill you. Dynamite can destroy metal creates though, so use that to your advantage. If a dynamite crate is hit on the left, it will fly to the right (kind of a law of gravity). If the dynamite crate is hit right, it will fly left. Sometimes dynamite is in a metal dynamite crate. You know what that means, right? It means that you cannot break the crate. An arrow will only be able to break a metal dynamite crate. Dynamite explosions may set off other dynamite crates (if nearby), causing a chain reaction. 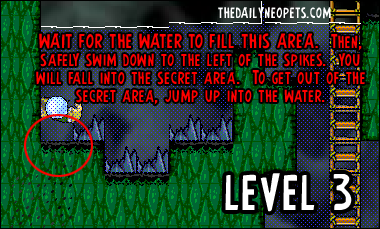 In levels, you will also encounter pools of water. Don't worry, you can swim in the water (hopefully it's not too cold, heh). However, you have limited life, or I should say breath while in the water. 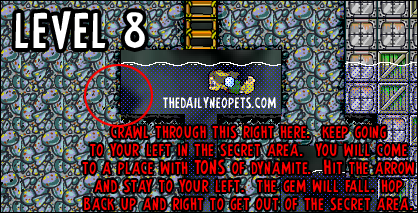 At the left-bottom hand of the screen, there is a row of bubbles. 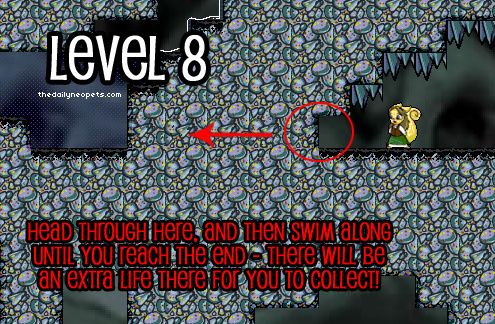 If those bubbles run out, you will die! You must return to the surface to "catch your breath." You're probably thinking, "Okay I get it now, sheesh!" Well, most of the game is actually understanding the physics of the game. If you understand what each crate does and such, you're ready to go! 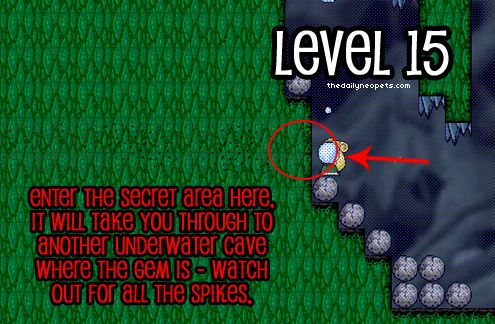 Okay, completing the levels isn't the hard part... it's finding the gem. The green gem will give you an additional 5,000 points to your score. 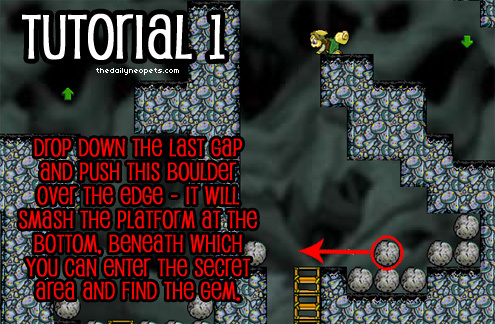 Here is how to get the gems. 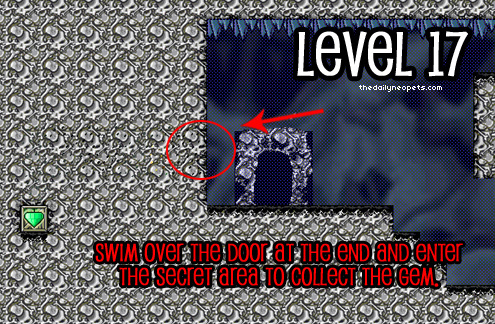 Due to a design error, the gem in this level is unobtainable. 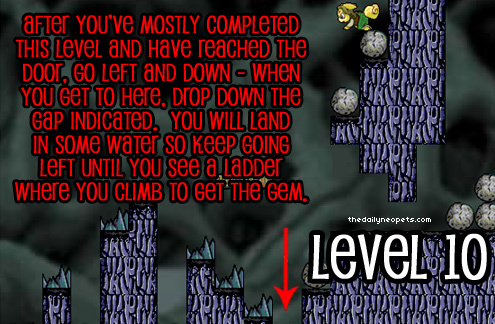 Like with level 7, you cannot get the gem in this level. 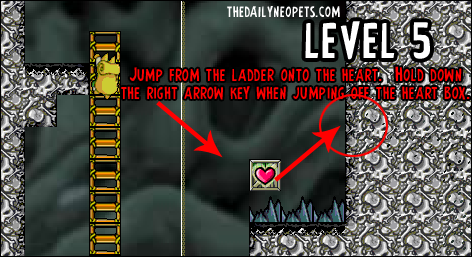 Neopets has also made a cave maker program, in which you can design your own cave. Other users can play your cave too! 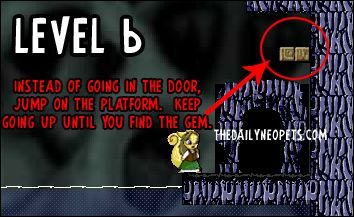 Be sure to check it out if you're a big fan of Hannah and the Pirate Caves (user caves in-game do not work in Mozilla Firefox). 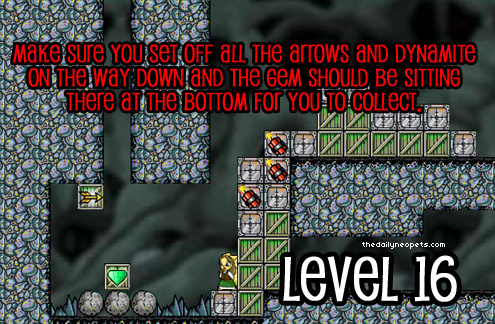 familyiiiii writes, "In level 9, at the end of the level, you must go down to get the treasure. 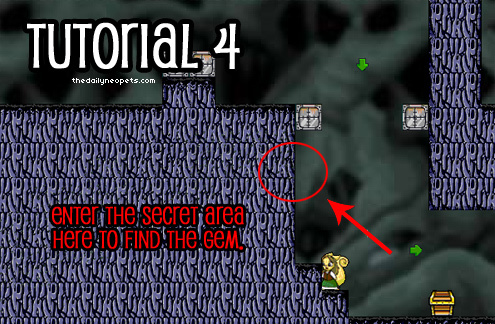 You will see a secret area on your right. You must swim up after you get through it. But you cant get the arrow that is there. Probably an error I suppose. Level 7 is also an error. 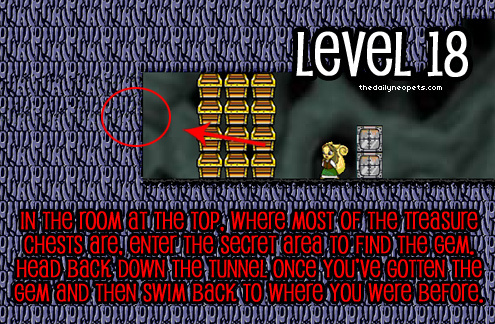 After you get into the water after the metal crates, once you get to the lowest part you can get in the water, at the bottom on your right there is a secret area, but you cant reach the arrow as well." 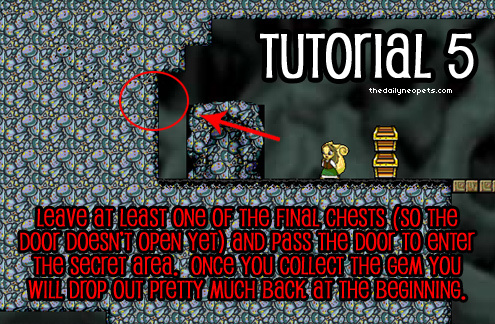 In conclusion, we've learned all of the basics of HATPC (Hannah and the Pirate Caves)! 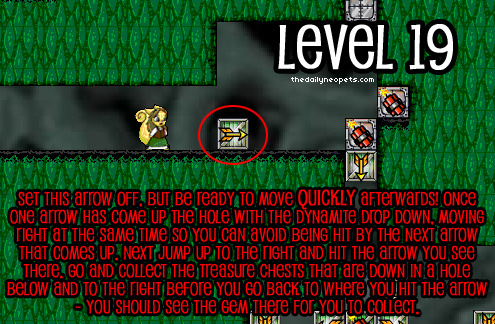 We've learned how to manuver ourselves throughout the level, learned what crates are which, and how to find all the gems. This is only the beginning! Enjoy your adventure!